Leo’s Deli Framlingham is a Suffolk delicatessen like no other. If you love food, you’re sure to fall in love with Leo’s Deli Framlingham. Our fine food selection just couldn’t be scrummier, and you’ll find plenty of top tips and tasty nuggets of advice in store too, courtesy of Leo’s highly approachable and expert team. Take your pick from our well-stocked fromagerie, renowned fine wines and delicious charcuterie. Enjoy our choice of local artisan breads from Orford’s Pump Street Bakery or make your own selection from our exquisite sweet treats including excellent Lauden chocolates. So what’s on your shopping list? Irresistible almond cantunccini, organic teas and anchovies? Marybelle milk or a big cheesey chunk of Bungay's Baron Bigod? 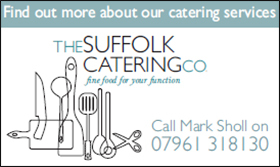 Fresh bread from a real artisan baker or smokehouse specials from the Suffolk Coast? Whether local and low on food miles or found far away, you can be sure that the fine foodstuffs on the shelves of Leo’s Deli Framlingham are sensitively sourced from small scale artisan producers who, just like us, are passionate, proud and who really care.